The City of Five Flags is the nickname given to Pensacola, the Florida beach town known for living under the rule of flags from Spain, France, England, the Confederacy and the United States. Each culture has left its mark on the seaside community evident today through architecture, history, museums and culinary delights. You will never be at a loss for things to do in Pensacola if you’re visiting as a family, a couple or solo. Pensacola is located in the Florida panhandle just across the state line from Gulf Shores, Alabama. It’s an easy drive from almost anywhere in the Southern states and folks from further away can fly into Pensacola International Airport and rent a car. Most people think of Pensacola in terms of a beach with gorgeous white, sandy shores and turquoise waters. While that may be true, there is so much more! A beautifully renovated downtown district beckons visitors to join the locals in shopping at one-of-a-kind boutiques, tasting decadent treats at cafes and sandwich shops, browsing art galleries and city tours that offer interactive ways to see Pensacola. Downtown Pensacola is only a short drive from the beach and is absolutely worth your time. You can park your car and walk to almost anywhere, and there are lots of resting places along the way. On Palafox, you can enjoy beautiful views, al fresco dining, and shopping. For vacationers and tourists, I have a few don’t miss attractions in the downtown district to put on your list of things to do in Pensacola. There is a living history exhibit of sorts offered and guided by Historic Pensacola Village Tour. A fabulous way to see some first-hand examples of the Pensacola of yesteryear, this inexpensive tour walks you through one of Florida’s oldest churches as well as some of the historic district’s most amazing homes from the Colonial and Victorian eras. Sometimes getting the younger vacationers involved in city tours is difficult. Maybe they aren’t envisioning something fun, but rather they are associating a look at history as being boring. Let me tell you, the very best way to have an excellent Pensacola city tour. Enjoy some family time and have a blast via Emerald Coast Tours! The tour guides have a way of mixing humor with facts to indulge every member of the family in a guided look at the heritage of Pensacola. You can thank me later. Of course, with all that touring, you will need some filling vittles to keep you going and lunch at Five Sisters is a great choice. Five Sisters is a Blues Café where you can enjoy taste bud specialties like Chicken and Waffles or your favorite Southern comfort foods infused with soul. Owner and Chef Cecil Johnson keeps the menu lively and the neighborhood hopping! Just outside the downtown area, Joe Patti’s Seafood Market is a Pensacola icon. This establishment has been around since the 1930s and is ranked the third best seafood market in the United States! No small feat, this family-owned and operated business offers a myriad of fresh fish choices along with a gourmet market featuring fresh baked breads, sushi and gelato for dessert! Most popular item? You guessed it – steamed shrimp with a loaf of delicious garlic bread! The Pensacola Bay Area is home to the renowned Blue Angels, officially known as the U.S. Navy Flight Demonstration Squadron. If you are in this seaside community on a Wednesday morning (11:30 to be exact) from March to November, make it a point to head over to the National Naval Aviation Museum for a tour of the world’s largest air and space museum, and to see a Blue Angels flight practice. The sound of the jets and the amazing maneuvers are managed perfectly by the talented pilots. It is sure to be a highlight of your trip! Plan to stay for lunch at the Cubi Bar Cafe for an extra treat – it is onsite, authentic and tasty! Afterwards, plan to stop and pay a visit to the Pensacola Lighthouse and Museum for fun photo opportunities as well as a fabulous dose of history. Climb the 177 steps to the top of the lighthouse for spectacular views of the Gulf Coast. 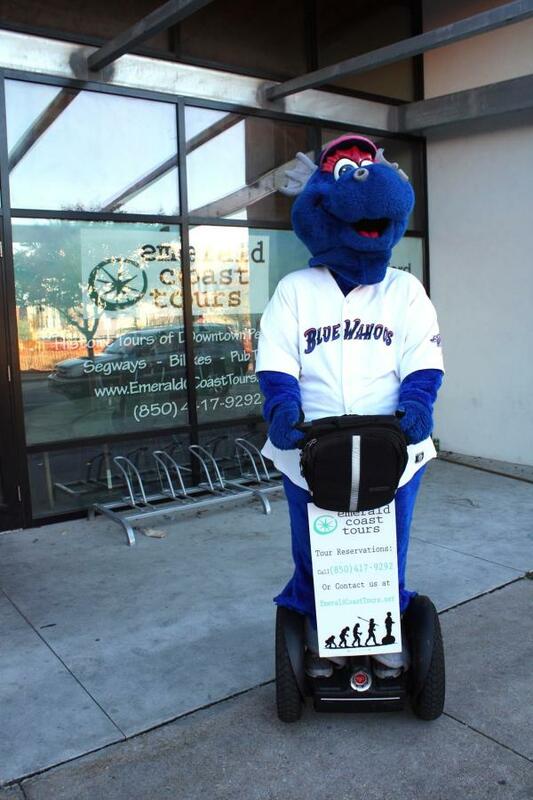 The Blue Wahoos are a minor league, Double-A affiliate of the Cincinnati Reds. Make sure to catch a game in Bayfront Stadium; the bayside views are a sight for sore eyes. Gulf Breeze Zoo is 50 acres of animals and hands-on exhibits. Kids will love the farm, the train ride and the educational zoo keeper talks! The Pensacola Beach Boardwalk is bursting with food, entertainment and shopping. Take in a spectacular sunset, join a family-friendly event or LIVE music. The Pensacola Beach Island Trolley is a great way to get around and with no cost. Check times and schedules on the website. Dolphin Cruises are always fun for families or couples and Premier Dolphin Cruise offers affordable cruises behind Hemingway’s Island Grill on the Pensacola Boardwalk. Enjoy amenities like onboard restrooms, a bar, music, food and souvenir sales. Taste of the Beach is a flavorful festival every September bringing top chefs and the best restaurants to Pensacola Beach. Tourists flock to taste their way through this weekend filled with all things southern, seafood, sweet and savory. The annual Pensacola Seafood Festival is held in Seville Square, Fountain Park and the waterfront Bartram Park in Downtown Pensacola the last weekend in September. The event attracts more than 100,000 attendees during the three-day festival filled with lots of seafood (fried mullet, shrimp and grits, and more,) vendors and arts and crafts. The Pensacola Greek Festival started as a luncheon in 1959 and today is a three-day event in the Fall. Be one of 20,000+ guests who come for the hospitality that Greeks refer to as filoxenia (friendliness to strangers). Take a tour of the Greek Orthodox Church and find fun in music, dancing, food and fellowship. 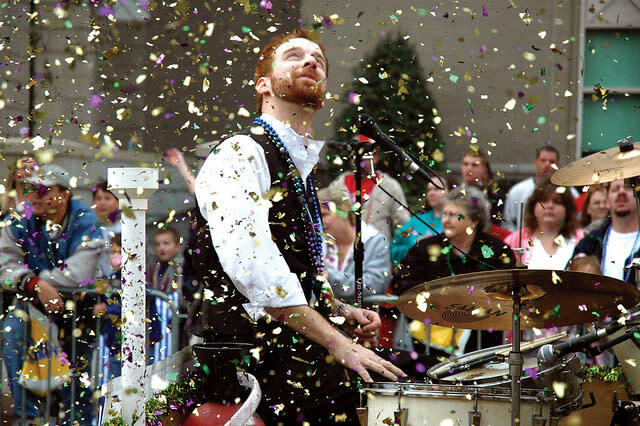 Mardi Gras is marked with a Grand Parade each February in the heart of Downtown Pensacola with several thousand participants. It takes some four hours for the parade to make its way down Palafox and Garden Streets. Local businesses and a variety of vendors take part by offering cocktails, King Cake and other festivities. It’s family-friendly with fun zones for kids, face painting, food and fun! Dog House Deli – one of my favorite places for breakfast, brunch or lunch. With unique menu options and two locations (one on the beach and one downtown), you’ll leave pleasantly plump with choices like a classic breakfast skillet or the breakfast burger! Jaco’s Bayfront Bar & Grille (South Palafox St) – flatbread pizzas and small plates with gorgeous views of the yachts in the Palafox Marina and Plaza de Luna Park. The Fish House – upscale dockside dining (South Barracks St) at its best featuring picturesque views and innovative recipes using seafood favorites and house-smoked steaks. Chef Jim Shirley is one of the five Pensacola Celebrity Chefs who presented their culinary treats at the James Beard House in New York City in March of 2013 for the third consecutive year. The dish to have is the Grits a Ya Ya – a world-famous southern dish of smoked Gouda cheese grits smothered in a sauce of fresh cream, sautéed Gulf shrimp, spinach, Portobello mushrooms, applewood-smoked bacon, garlic and shallots! The Fish House also has live music – a definite plus! Also, check the website for daily happy hour info. The Flora Bama Yacht Club – sinfully good chef to table experience in an open-air waterfront atmosphere. A local favorite, folks love the hand-crafted cocktails and appetizers. My favorite app is the Firecracker Calamari and my favorite entree is always the Fresh Catch of the Day! Lounge to live music and watch the sunset…you can’t beat it! H2O Cajun-Asian Grill – Celebrity Chef Dan Dunn throws a Cajun-Asian spin on some seafood favorites and American fare to pair up with premium wines! Check it out at the Hilton Pensacola Beach. Hemingway’s Island Grill – casual dockside dining overlooking the Santa Rosa Sound. An award-winning restaurant, Hemingway features a diverse menu of fresh seafood, sultry steaks, and succulent poultry. Peg Leg Pete’s – a local favorite on the marina with a kid’s play yard, appetizers (Snow Crab Legs, oysters and Classic Shrimp Cocktail), delicious entrees (Chargrilled Mahi-Mahi and Grilled Grouper) and desserts to die for (Bread Pudding with Amaretto Sauce or Key Lime Pie). 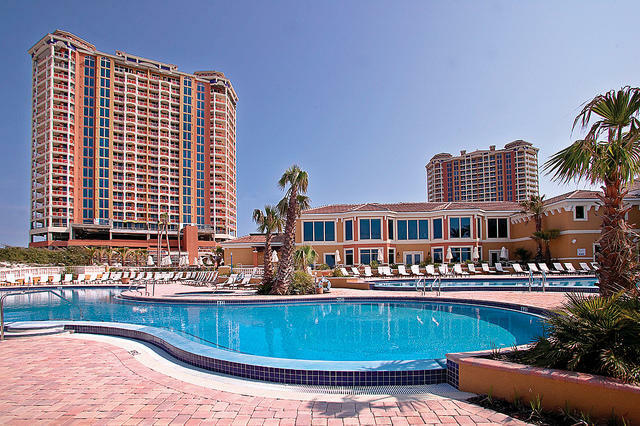 Pensacola offers an array of accommodations including upscale hotels like the Hilton Pensacola Beach with onsite restaurants, daily cleaning service and beachside views. Plan to enjoy at least one meal at H20 Cajun-Asian Grill inside the Hilton. Portofino Island Resort is a fantastic choice for families looking for a spacious, luxury condo…with all the fixings from tennis to swimming! Recent enhancements mean even more upscale amenities for vacationers who want the best value available. Portofino offers two- and three-bedroom suites with private balconies overlooking the Gulf of Mexico or the Santa Rosa Sound. Lose yourself in the pampering spa, take a sailing or fishing charter, take advantage of on-site dining and shopping, visit the fitness center and so much more! I also highly recommend Sailmaker’s Place on Perdido Key just East of Ono Island on Florida’s beautiful Gulf Coast. Sailmaker’s Place offers balcony views from every unit, modern amenities and basically everything a family needs to enjoy their vacation in a slightly off-the-beaten-path location. And, if you think this is useful information for next summer’s vacation, you are right! But, the shoulder seasons (Spring and Fall) are even better! They offer the same beautiful beaches, mild temperatures, fantastic culinary venues and a plethora of activities. So, don’t wait – plan a little retreat to Florida’s panhandle! Pensacola is a unique destination where the path beyond the beach is as good as the path leading to the beach!